Preschoolers are invited to participate in therapy sessions and are provided with developmentally appropriate art, play and talk activities designed to help parents and children improve communication. We provide special expertise and extensive experience in the area of providing therapy for families in Early Childhood. We will help you implement strategies which are appropriate to the developmental tasks and stages of your individual child. This sets a foundation for respect, communication and realistic expectations for each family member. If your child is showing behaviors or attitudes that are of concern to you, we are dedicated to helping you learn techniques that you can start using right away to reduce negative symptoms and improve happiness. Help your child and family feel better now. We can help! 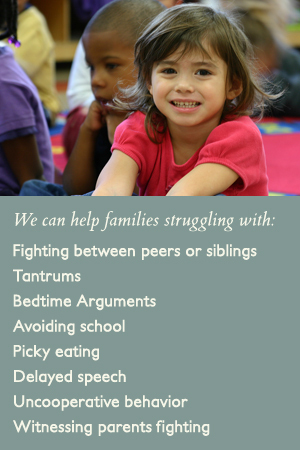 When your child is acting out or refusing to cooperate, it is normal to feel irritated and stressed. Here are a few ideas to increase peace and cooperation if you have young children in your home. 1. Your attention is the most valuable reinforcer to your child. Paying attention to him gives him a sense of self worth and importance. What does it mean to you to really pay attention to your child? Try to give your child your undivided attention at least twenty minutes a day. This undivided attention on a regular basis will improve cooperation and reduce tantrums. 2. This means silence all electronics and play with your child in a child directed activity. You become an actor in your child's play scenario. Be a doggy or kitty, crawl around on the floor, play with the pets, use dolls, cars or dinosaurs or whatever interests the child. Make sure to allow the child to be the leader. Don't teach or suggest. This twenty minute play interval, also known as Floor Time is an insurance policy which will get you better cooperation throughout the day and will strengthen attachment and adjustment. 3. Early childhood problems are most often treated in family therapy as opposed to bringing the child in as an individual and making him or her the "Patient." The goal is to help You be more confident handling issues that come up as you go through your daily life process, and help your child improve communication, behavior and adjustment.